The Hotel Martinez – formally known as the Grand Hyatt Cannes Hotel Martinez – is one of the most iconic hotels in Cannes, and therefore of the French Riviera. The distinguished Art Deco building is a key landmark on the Croisette, and plays a part in the major events in Cannes such as the Cannes Film festival, MIPCOM and Midem. The new general Manager, Alessandro Cresta (photo), is a Swiss/French national of Italian origin who began his career in the hotel industry with an apprenticeship in “Service, Sommellerie and Cuisine” in Switzerland followed by experiences at The Dorchester London and at the Canadian Pacific Plaza in Frankfurt. Later, he joined the Hyatt Montreux Hotel in the gastronomic restaurant. 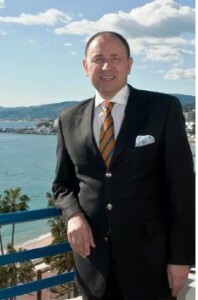 In 1989, following his studies at the renowned Hotel Management School of Geneva (Ecole Hôtelière de Genève), he started his career with Holiday Inn Incorporation as Banqueting Manager for the opening of the Hotel Crowne Plaza Geneva, and subsequently was assigned to various positions in Sales & Marketing over a 12 years period. he worked at the Martinez previously and joined Hyatt in 2013. In 1927, the aristocratic hotel manager Emmanuel Michele Martinez decided to make the most of his connections with nobility and create his own grand hotel, after working in luxury hotels around the world. At the time he was also Director of the Cannes Luxury Hotel Association. He bought the “Villa Marie-Therese” on September 22, 1927, from His Royal Highness Alphose de Bourbon and named the Hotel after himself. During World War II, the Hôtel Martinez was occupied successively by the French and Italian armies, by the Commission d’armistice, the German Army, and (after the Liberation) by the USA. Air Force. The hotel was sold in 2012 and joined the Hyatt chain on April 9, 2013 and was renamed the Grand Hyatt Cannes Hotel Martinez. With Cannes 2016 on the horizon, Cresta will no doubt be given a baptism of fire over the coming months. For booking, visit The Grand Hyatt Cannes Hotel Martinez.